Ross Mirkarimi, the long-time San Francisco progressive politician who, after being termed out as District Five Supervisor, was elected to be San Francisco’s Sheriff, only to be suspended from his job, by court stay-away order separated from his wife Eliana Lopez (who moved to her native home Venezuela January 13th, 2012), and all after an New Year’s Eve day argument that turned violent enough for Lopez to approach a neighbor named Ivory Madison for assistance. After two months of back-and-forth texts, Ross agreed to meet me for a wide ranging interview conducted at the Royal Ground Coffee Cafe at 2060 Fillmore Street in San Francisco’s Pacific Heights on Father’s Day. As a note, Ross is a friend of mine, but the issue is extremely serious, so I worked to strike a balance – get to the core matters of concern without harming someone who’s psyche has already been badly damaged. So those looking for a video where I trap and demoralize Mirkarimi can look elsewhere; but an intelligent listener will pick up a lot from our talk. What follows is essentially a transcribed version of the video. 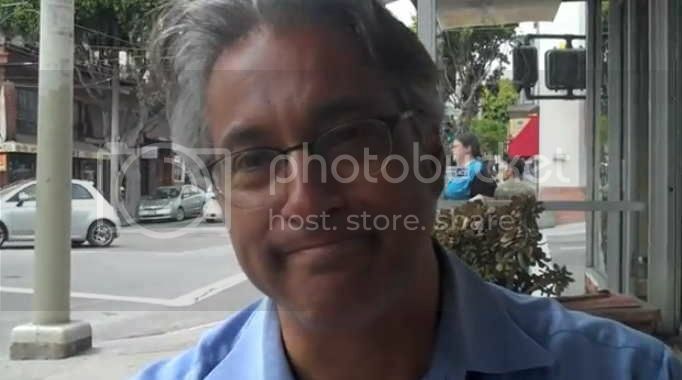 Zennie Abraham, or “Me”: Ross Mirkarimi. Was elected Sheriff; now suspended. But for those who don’t know the story, say in Bangladesh, tell them who you are. Ross Mirkarimi: The few people who don’t know this story. I’m Ross Mirkarimi. I am honored and proud to have been a supervisor, a City and County Supervisor, for seven years representing District Five. And then Last November, I was elected sheriff at the same time when Ed Lee was elected Mayor and George Gascon was elected district attorney. It was the first time in 25 years that anybody progressive had been elected to a city wide office. And so this really perked up eyebrows and ears by our victory last November against a hotly contested race of several other opponents. And we really started to make our mark early on – once leading up to that race, and taking office. Ross Mirkarimi: “Actually December 31st New Year’s Eve day. Where my wife and I were heading this direction for lunch actually (we were on Fillmore and California Streets and Ross pointed behind and to his right, or left) to a place where they don’t take reservations, Delfina’s Pizza over here (at 2406 California Street). (I explained to Ross that my choice of meetup place was totally coincidental.) It was New Years’s Eve, they don’t take reservations, and we were quarreling and we were with our them two-and-a-half-year-old son Theo – beautiful little boy. Me: I forgot to say ‘Happy Father’s Day’ by the way. Ross Mirkarimi: “Thank you. It’s bittersweet, not having my family here, but I get through because I’m able to communicate by Skype with my son who’s in Venezuela with his mother. But em, we were on our way – the quarrel, which is something that had been unresolved, is about long bouts, trips, my wife would take with my son abroad to Venezuela for some months. This time we were talking about a plan which we didn’t come to an agreement to and I turned the car around against my wife’s wishes, which is considered, and what I eventually pled to is a misdemeanor – false imprisonment. So we didn’t go to lunch, I turned the car around against her wishes, so we didn’t argue here. And then after parking the car, and reacting intensely, wrongly on my part, to the argument we were having, tried to deescalate or respond in a way that obviously wasn’t smart, I reached out and I grabbed my wife’s arm and it got bruised on the right, under here (gesturing). She had shared this information with a neighbor she thought was an attorney. Ross Mirkarimi: “That’s right. And without.. in confiding to this neighbor, because of, in my wife’s words, (and) what we’ve since read over the last few months and understand, you know is a potential custody issue that was related to the argument we had earlier. Confiding to this neighbor, the neighbor went ahead without my wife’s consent, betrayed from what we can tell, and began to float this story, gave my wife’s information to a number of people. Not authorities, but other people like Phil Bronstein, the Executive Editor Of The Chronicle. Ross Mirkarimi: “Him, directly. And other people. They (Ivory Madison and her husband) are good friends with Christine and Phil as I understand. And other people. Then several days later, after that occurred, contacted authorities – that became a runaway train. And, whether,… You know conspiracy theorist or whomever wants to believe that this is opportunity for those who didn’t support me in office like the police and others to get me out, whatever your version is, this is the ammunition that they have been running with, to use against me to try to remove me from the elected position of sheriff, under the grounds of official misconduct. Ross: “She was a supporter, she was. Yeah. Absolutely. Me: “Today, Ivory Madison and the City Attorney’s Office have released a document that..
Ross: “It’s a declaration.” It’s their witness. It’s a declaration. Ross: “Well. Since Madison (Ivory Madison) was developing a rapport with my wife, my wife’s understand (was) that she was her attorney. (Ivory Madison is said to be a non-practicing lawyer.) Sounds like the best defense is a great offense – that’s what it sounds like it is from Madison’s perspective. Is trying to go on the attack against me and my wife and fortify their actions, and..
Me: “Are you saying that Madison is her attorney or acting as her attorney. Was she legally hired to be your wife’s attorney? Ross: “Well that’s a good question for my wife, in one respect. But everything that’s come out since is that’s exactly what my wife thought. that Madison was her attorney. And my wife was, needless to say, shocked, when Madison decided to take actions in her own hand to release a video my wife said she didn’t want her to release. Me: “So you’re wife is alleging that attorney-client privilege was damaged? Ross: “It’s been on-going installments of an ethics panel. It is an appointed body. There’s five members on the ethics panel. It’s essentially volunteer public servants appointed by the Mayor, District Attorney, City Attorney, Assessor, and the Board Of Supervisors. They have a lot of power in this case, and this case is unprecedented in San Francisco. I was duly elected. Received considerably more votes than Mayor Lee himself. And for the Mayor to single-handedly remove an elected peer without peer, without due process, then not explain to be what the (reason) for the removal was, then months later then develop the charges through this ethics panel, leaves quite a bit for challenge. Which is what we’re challenging under this ethics panel. There have been several hearings, and their will be several more. Once the ethics panel hears the evidence, and the Mayor’s case and our defense, (it) goes to the Board of Supervisors where they will have 30-days to render a decision of reinstatement or not. Ross Mirkarimi: “Well, we can interview some other time to see what the outcome might be. If it’s not in my favor, what the B or C plan might be. Then in my favor, I will resume my position as sheriff, and continue to move forward as to what the voters who elected me to do last November. And I was acting sheriff for almost three months before I was suspended without pay and it was quite a bit I had been doing. In my inaugural January 8th at Herbst Theater, in front of nearly a thousand people, I made it very clear what policy must be vision, and I said that San Francisco often get to rest on its liberal laurals, as if its that progressive or cutting edge; when it comes to criminal justice, I don’t always find that (in San Francisco). When I see our county jail population is 60 percent African American, and nobody speaks of the nexus between a disproportionate population, where one out of 14 black men are in San Francisco’s County Jail, and they talk about the outmigration of African Americans from the City, going to more affordable places. They never talk about that they’re not just going to the East Bay or – they’re actually going to county jail. Ross Mirkarimi: “The punishment doesn’t fit the crime. I mean what I did was wrong, and I have since the outset of this, I’ve said number one, I have to believe in the process. As a public servant, I want to believe in the process. I don’t necessarily like the way they’re trying to leverage the process as a hammer to try to oust me. But I have to believe the integrity of the process – advocate for the integrity of a legal process and of its civil administrative process, that is hopefully even in its justice. And it hasn’t been. And for what I did with my wife, I acted wrong, and I did, I accepted full responsibility for completely, and taken action to adress that. But people have to remember that as a District Five Supervisor I tackled violent crime because I inherited a district that had the second highest homicide rate for years, which has since plummeted, as a candidate for sheriff who said if we want to reduce repeat offender rates, recidivism, we must appreciate what the power of redemption looks like. And the power of redemption is something that is easier said than done. And that means, even in a city like San Francisco, that means giving people a second chance – never in my wildest nightmare could I imagine being an example of that need. Me: “Now, a couple of good friends of mine from your sheriff department told me that you were on your way toward making some significant reforms? Ross Mirkarimi: “Sure. Quite a few reforms, and some within the deputy sheriffs, and to their benefit, even though they didn’t support me, and did my opponent. But they didn’t support my predecessor either and his eight terms of office, Mike Hennessy, who supported me, and still does by the way, he told me, and is submitting a declaration to the ethics commission on my behalf. “First of all, I think the deputy sheriffs are talented men and women who are credentialed in exactly the same way as a police officer. And I think the deputy sheriffs in addition have something to offer to the management of the county jail system and their programs that are associated with the sheriff’s department – and also help with, I think, policing in San Francisco when the police are having staffing deficiencies. I don’t think that people should take the sheriffs for granted or dismiss how effective they can be. And they’re paid less than PD. So, they would actually be saving tax payers money. Those are some of the reforms that we had in cue just as I was being, getting them more activated in a larger public safety way. Me: “Now lets’ do some housecleaning. It’s reported in the in the media, and I think it’s a mistake, that you were convicted of domestic violence – it was dropped? Was it not? Ross: “Three charges of misdemeanors were dropped – the charge that I pled to was false imprisonment, notice 236. And the stipulation to that had to do with the incident December 31st, that had to do with me turning the car around against my wife’s wishes, going to lunch. Me: “But the bottom line is that what’s reported by some blogs is that you were convicted of domestic violence, but you were not? Correct? Ross Mirkarimi: “Well, it depends what.. Yes! I mean. I say yes, in the sense that..
Ross Mirkarimi: “I think strictly speaking, I think, yes, of course. Because I think that’s the charge they were waging that’s what – I think that’s what false imprisonment they are associating with. Yes. Me: “And then you also asked that the legal charges be picked up by the City, but the City Attorney said no, right? Ross: “Well I can see my son, but they’ve stopped him too, and there’s literally no restriction. The District Attorney objects (to letting Ross have family contact) and the courts agree. We’re going to court this week actually to fight that because they’ve gone too far. You kind of have to view this as a choking strategy to just kind of wear me down to the point where I just resign. ‘Maybe he’ll just resign if we make it hard enough.’ And that’ not just me who’s arrived at that, that the scores of people who come up to me in the streets, who read what they read like you do, and say like ‘Geezus man. They’ve gone way too far. And those are the very common comments I get – all quarters of San Francisco. And they have gone too far. Punishment doesn’t fit the crime. Ross: “Well, less confidence surely now. I mean not as confident – somebody who was just feeling on top of the World, was just elected sheriff, and have a beautiful family. Neglected the kind of things I think I should watch out for. Arrived at a place where I think there was distress between me and my wife, family, etc. But all that did not earn or merit the level of vitriol that – the level of attack, retribution that is occurring right now. That is the wrong example to set in a city that prides itself on being just and forward thinking – it’s just the wrong example to set in San Francisco which is why we’re fighting this. So whatever the outcome is, it’s important not to let it go unchallenged. It really is important. No matter what one thinks of me, my politics – in fact, I encourage anyone if you don’t believe me, take my wife’s word for it, Eliana. Because if the Mayor or a neighbor wants to justify their actions using Eliana, well, Eliana in her April 6th opinion piece that was published in the Chronicle, I think spells it out really well as to how people should interpret this – refer to her perspective; don’t have to refer to mine. Be the first to comment on "Ross Mirkarimi Interview With SF Sheriff Suspended Due To Claim Of Domestic Violence"